by Bill Pitts; carousel photos courtesy of the Jackson Friends of the Zoo; carved animal photos courtesy of Carousel Works. In the fall of 2004, the Jackson Zoological Park in Jackson, Mississippi, joined a growing number of zoos and parks that have added carousels to their list of attractions. And the Jackson Friends of the Zoo Carousel is a one-of-a-kind, as it features Mississippi animals in its wooden menagerie as well as the usual animals such as giraffes, lions, and elephants. Realistically hand-carved in what is known as the Philadelphia style, the animals portrayed include endangered species of Mississippi, a decision in keeping with one of the overall concerns of zoos everywhere — public awareness. Be on the look out for a Mississippi catfish, a white-tailed deer, a black bear, a mountain lion, raccoon, fox, and a river otter, among others. 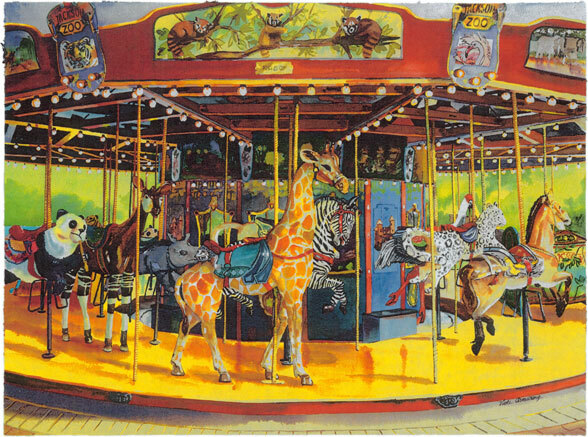 An artist’s rendering (above) of the carousel only served to give us a hint of how the final product would look (below). 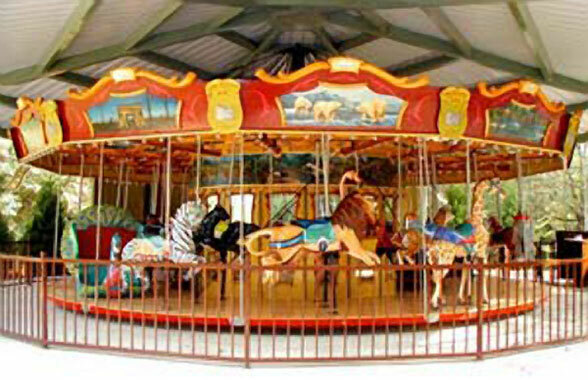 Built by the renowned Carousel Works in Mansfield, Ohio, the only company in the world with the in-house capability for the manufacture of one or more full-size carousels a year, the Jackson Zoo’s carousel is housed under a steel pavilion located in the center of the Zoo in front of the administrative offices. 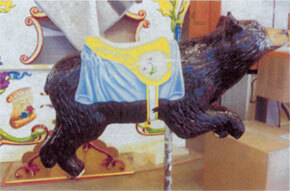 The Carousel Works was started in the latter part of the 1980s by two talented individuals who possessed the skills necessary for such an undertaking: carving, woodworking, pattern making, casting, engineering, machine shop techniques, and artistic painting. They carry on a craft with historic ties to the Byzantine Empire of 500 AD. The carousel as we know it today was born in France in the late-17th Century and served as a horsemanship training device for young royalty. Not long after this method of training was introduced, versions made specifically for the general public began to appear, built by local craftsmen. When German immigrant Gustav Dentzel opened the “G.A. Dentzel Steam and Horsepower Carousel Company” in Philadelphia, Pennsylvania in 1860, he brought America into the beginnings of the “Golden Age” of the hand-carved wooden carousel. This period lasted for about half of a century and saw major improvements made to the basic mechanical design of the carousel. Mississippi boasts one of the remaining Dentzel Carousels in Meridian’s Highland Park. 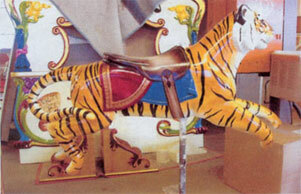 Economic pressures brought an end to this “Golden Age,” with aluminum replacing wood as a more cost-effective material from which to shape the carousel animals. And the quarter century following the end of World War II brought even more changes, with fiberglass replacing aluminum. 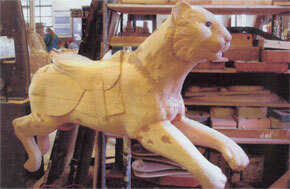 But some felt that the soul of the carousel, the hand-carved artistry that went into each animal, had disappeared. 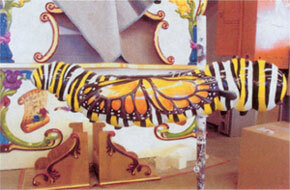 Enter Carousel Works, and the talents and dedication of Art Ritchie and Dan Jones. These craftsmen, and other like them, are giving today’s children, regardless of age, the chance to experience the thrill in the timeless magic of the carousel. 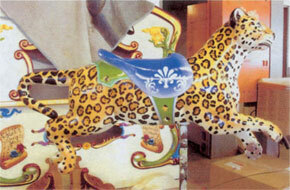 Great care was taken to make each hand-painted animal an individual work of art. All carousel paintings were hand-selected with some depicting items representing the state of Mississippi, such as the state flower—the Magnolia, and state bird—the Mockingbird. There is no other carousel like this one in the country. Some of the paintings on the top rounding boards represent old photos from the Zoo such as the Monkey Castle, Livingston Lake, and the old Zoo entrance from the 1920s. The Friends of the Zoo began the planning stages of the project in September of 2003 and the actual installation of the carousel began in September of 2004. It took only three weeks to complete thefoundation thanks to the hard work of Nall Construction. 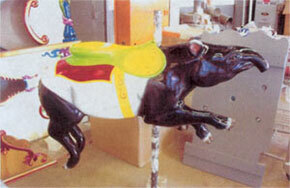 The fine staff of Carousel Works came in, and had the carousel up and running in record time! This project has been a labor of love and is a beautiful new addition to the Jackson Zoo. Rides cost $2.00 in addition to the Zoo's admission cost. Children under three and a half feet in height must have an adult stand next to them, but that adult gets to ride free! And who said kids get all the breaks?